As a frequent user of browser extensions sooner or later you might already have grown the desire, to be able to arrange the ”browser action“ buttons of installed extensions to your own liking rather than in the order of installation. The browser takes the order in which the buttons are arranged from the ”Preferences“ settings file, which is stored in your profile data folder in a JSON formatting. You could certainly tweak the file using nothing but a text editor, but as the extensions in the list specifying the toolbar button order are referred to by their lengthy id string and not a name, that might be an annoying job to perform and might involve a lot of confusion control. 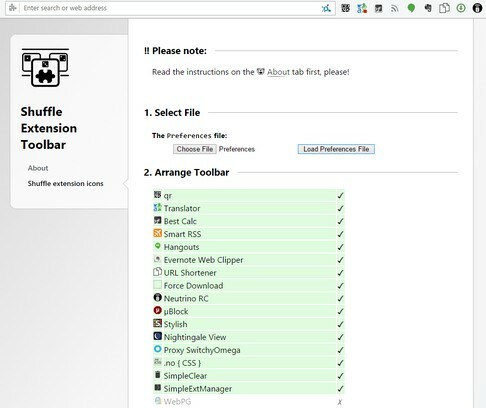 Here the ”Shuffle Extension Toolbar“ extension comes to rescue, letting you drag-and-drop sort a table of descriptive extension names instead, giving you the freshly arranged JSON list of extension ids back, that you can merge into your ”Preferences“ file using your favorite text editor. 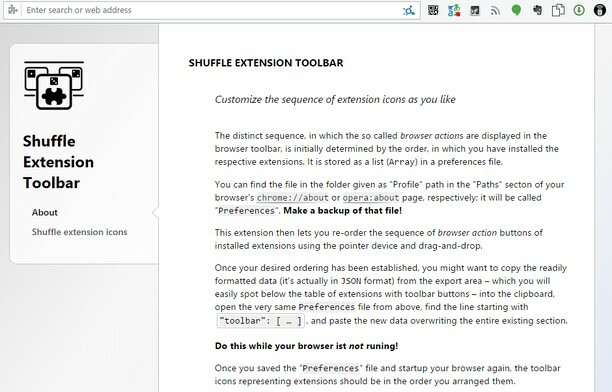 ‼ Go to Opera »» Extensions »» Shuffle Extension Toolbar »» Options. The distinct sequence, in which the so called browser actions are displayed in the browser toolbar, is initially determined by the order, in which you have installed the respective extensions. This extension then lets you re-order the sequence of ”browser action“ buttons of installed extensions using the pointer device and drag-and-drop. It is stored as a list in a preferences file. You can find the file in the folder given as ”Profile“ path in the ”Paths“ section of your browser's »chrome://about« or »opera:about« page, respectively; it will be called ”Preferences“. ‼ NOTE: Always make a fresh backup of that file *after* you shut down the browser and *before* you modify the file! Once you saved the ”Preferences“ file and startup your browser again, the toolbar icons representing extensions should be in the order you arranged them.